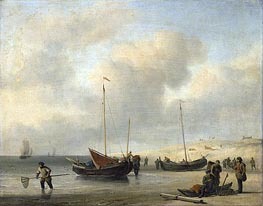 Willem van de Velde, the Younger (bapt. 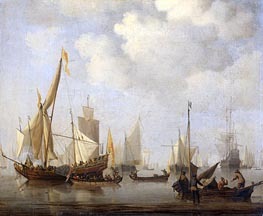 Dec 18, 1633, Leiden - April 6, 1707, London), was a Dutch painter. 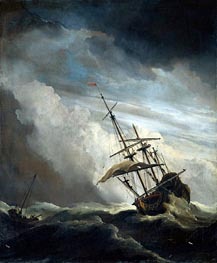 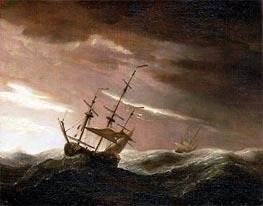 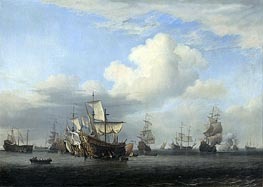 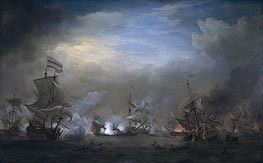 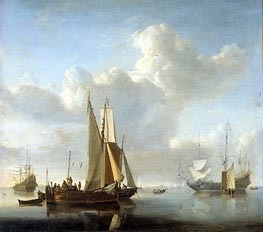 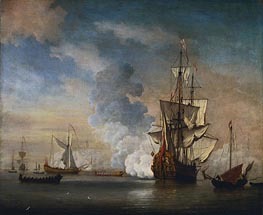 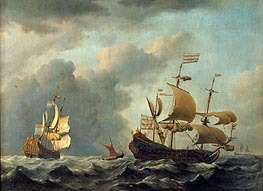 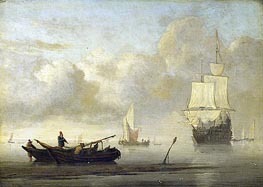 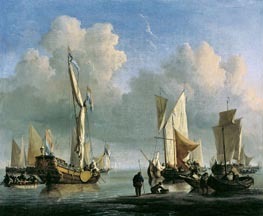 A son of Willem van de Velde, the elder, also a painter of sea-pieces, Willem van de Velde, the younger, was instructed by his father, and afterwards by Simon de Vlieger, a marine painter of repute at the time, and had achieved great celebrity by his art before he came to London. 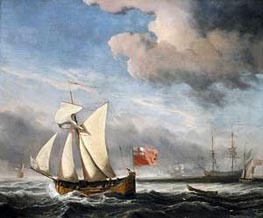 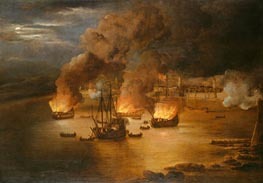 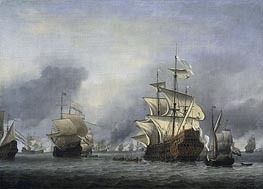 In 1673 he moved to England, where he was engaged by Charles II, at a salary of £100, to aid his father in "taking and making draughts of sea-fights", his part of the work being to reproduce in color the drawings of the elder van de Velde. 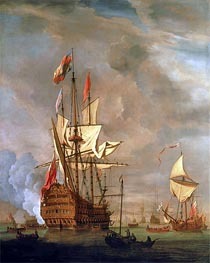 He was also patronized by the Duke of York and by various members of the nobility. 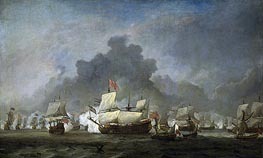 He died in London. 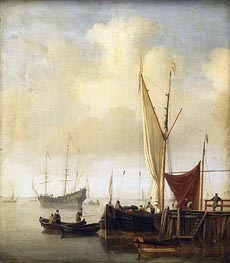 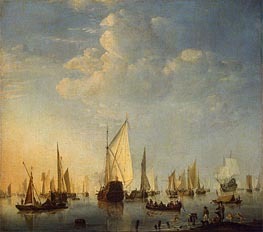 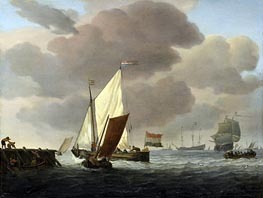 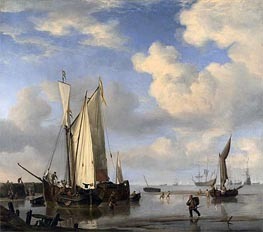 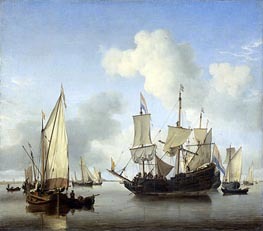 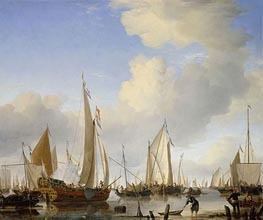 Most of Van de Velde's finest works represent views off the coast of Holland, with Dutch shipping. 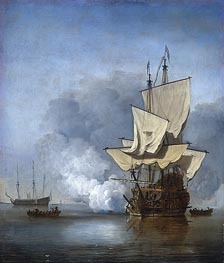 His best productions are delicate, spirited and finished in handling, and correct in the drawing of the vessels and their rigging. 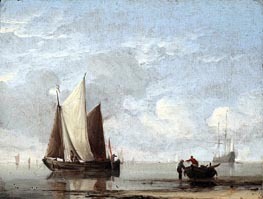 The numerous figures are tellingly introduced, and the artist is successful in his renderings of sea, whether in calm or storm.